This is the family of Maria de Jesus Rodriguez and John Earl Rothenbach. The Mexican and German culture combined with the Texian, provided their five girls with a rich, colorful and unique heritage. 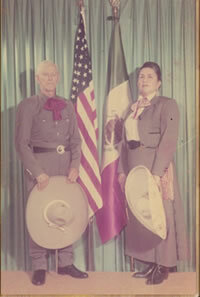 The photograph on the left, shows John and Maria in their Charro dress and standing with the American and Mexican flags. Through Maria's efforts and dedication, and the support of her husband, she founded Rancho Allegre Association, to maintain the Mexican cowboy's skills and showmanship on horseback. She also founded El Concurso de las Adelitas, an organization that keeps alive the spirit and culture of the women that fought alongside the men during the Mexican Revolution. The girls learned to ride side saddle and performed in the Charriadas (Rodeos) as well as the annual parades in San Antonio. Their colorful and unique dress, represent the style worn by the women fighters in the Mexican Revolution. Maria ensured her family observed Mexican holidays in the traditional ways. Her kitchen filled the air with aromas of specialties from her region. The Christmas season especially reflected the Mexican culture in the foods, religious observation and the traditional Nacimiento (Nativity) display, for which she has received many recognitions in her community and from the Mexican government. For her efforts to keep alive her ethnic culture, Maria was honored with the distinct and prestigious title of "Hidalgo", which was conferred upon her in August 2004, by the Commissioners of Bexar County, Texas.